Master Splinter has a nightmare about being caged and when he awakes, he determines that it’s time for the Turtles to leave Japan. Splinter, Mike, Don, Leo, Raph and Ninjara bid farewell to April (who is flying home) and their other friends and set off for China. After a very long trip, our heroes finally arrive in Tibet. They rent some yaks to climb the mountains on the last leg of their journey, and discover a four armed tiger named Katmandu in battle with Whirling Dervish assassins on the high trail. 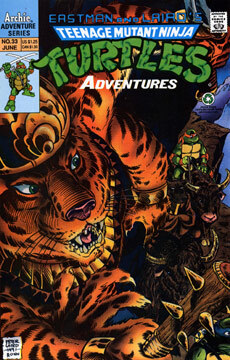 The TMNT help Katmandu and discover that he is headed to the same place that they seek – the Crystal Palace, which is home to Master Splinter’s spiritual guide, Charlie Llama. Katmandu explains that he wishes to become a guardian of Charlie Llama to improve his karma. As the group arrives at the palace, they discover that it’s been attacked! Before anyone can get their bearings, a skeletal dervish escapes the scene, laughing as it goes.